Okay, you’ve heard it a million times that this causes high blood pressure, high cholesterol, high blood sugar and what else! But then came a movement backing this up as actually very healthy if done right. What Really Cause High Blood Pressure, High Cholesterol, High Blood Sugar? A new British study published in The JAMA Network Journals, dug deeper—all the way to gene level—to find the answer for us. And it may surprise you. Body mass index (BMI) calculates how you measure up for your weight according to your height. It tells you if you are underweight, normal, overweight or obese. Makes sense. A 6 feet man weighing 180 pounds is considered normal weight, whereas a 5 feet man of the same weight would be obese. The problem is that according to this measurement, many top athletes would be obese because they’ve so much muscle. This has caused many people to disregard BMI as a good indicator of high blood pressure, cholesterol and blood sugar risk. What Does BMI Got to Do with High Blood Pressure, High Cholesterol, High Blood Sugar? So, researchers took a little different approach. You see, there are specific genes that are more common among people with high BMI and are therefore considered as a cause of high BMI. So, the researchers dug into data of 120,000 people and compared those with BMI genes to those without those genes. 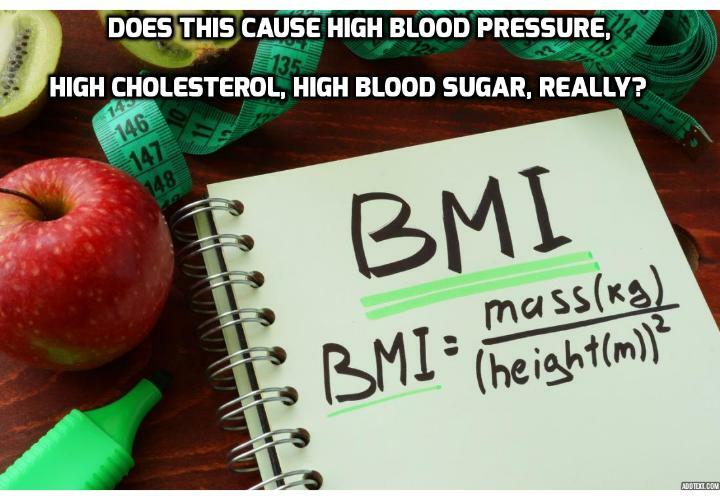 And what would you think… yes, those with the BMI genes were much more likely to have high blood pressure, high cholesterol, high blood sugar. This again boosts high BMI as a good indicator tool of a risk factor. But not an absolute. Even if you have high BMI and even if you hold the genes that cause high BMI, there are still many things you can do to keep healthy. Watch this Video – Here’s a Fruit That Lowers Cholesterol, Cures High Blood Pressure and Controls Diabetes!